Inis Ór is an Irish perfume in a spray bottle. Sorry, this Inis fragrance has been retired. 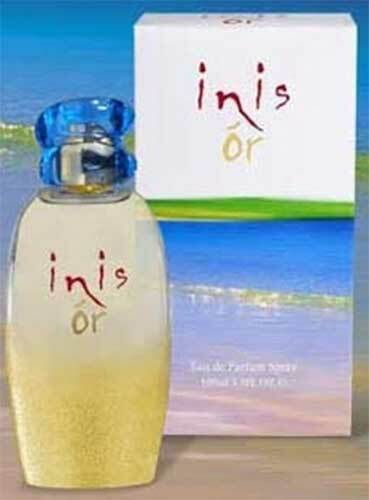 Inis Ór Irish perfume, is an Eau de Parfum or EdP. Eau de Parfum contains the second highest levels of perfume oils and is very popular. At a concentration of 15-22% it is slightly lighter than a ‘pure’ parfum but may not be any less expensive. You could expect an eau de parfum to last four to five hours. Inis Ór, Eau de Parfum, comes in a 50ml (1.7 ounce) spray bottle and it is made in Ireland by The Fragrances of Ireland. Inis Ór Irish perfume exhibits a passion for life that is emulated in the rich citrus top notes that are given vitality with the fresh green middle notes and the warm sensuality of the spiced earthy woody base notes. Innisfree, The Essence of Ireland, is an Irish perfume. Connemara spray is a floral Irish fragrance for women.